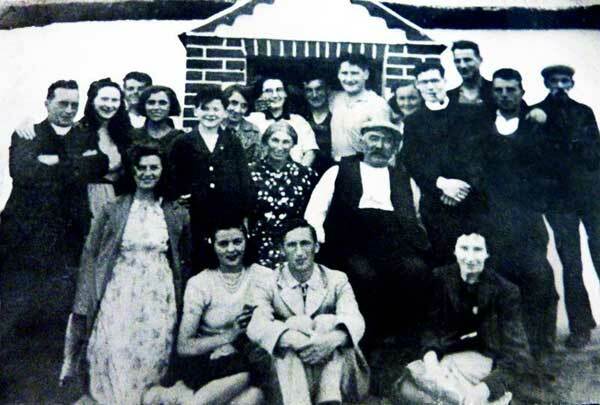 A short story by Michael McLaverty about a visit to Inishmurray in 1933. The view north to Inishmurray, the Holy Island of County Sligo, from the ruined Abbey at Staid close to Streedagh. 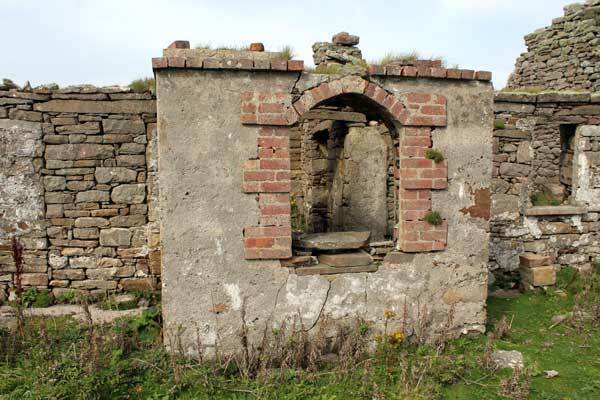 The monastery on Inishmurray is said to have been founded around 520 AD by the mysterious Saint Molaise, a figure also associated with Rossinver and Devenish Island in Lough Erne. 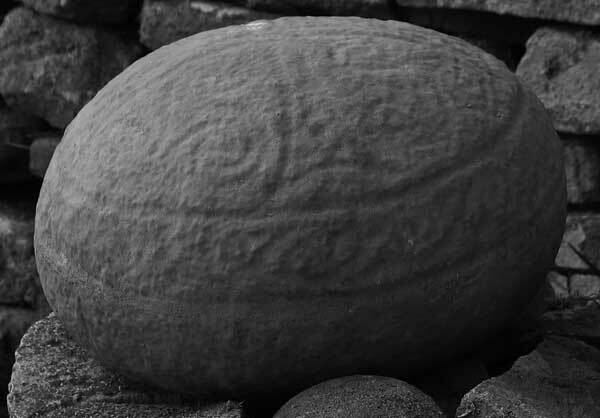 The Annals relate that the monks inhabited the island from the sixth to the twelth century, when they moved to the mainland at Screen and Aughris in west Sligo. 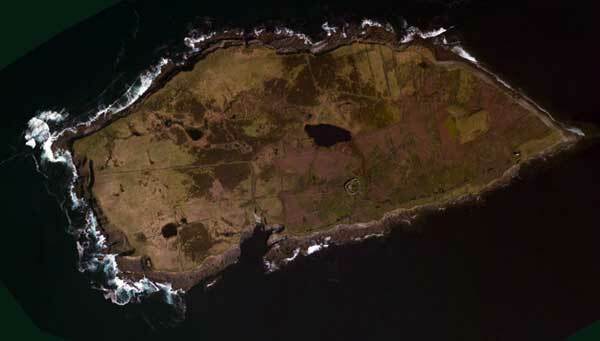 Inishmurray from above; image Bing Maps. To many Irish ears the name Inishmurray may sound strange. It is a small rocky island lying out in the Atlantic about 10 miles off the coast of Sligo. I venture to assert that of all the islands of Ireland it is the most destitute of tourists. It will never be overrun with them, for the Island is almost inaccessible; and granting that there were suitable boating facilities the Island would still remain immune. The reason is simple. There is no accommodation. There are eleven houses on it, all thatched and clean, and their inhabitants - more's the pity - speak English. There are some cows, a few donkeys, one jennet, some fields of potatoes, barley, and grass, and a host of coloured hens and quacking ducks. There are no shops, no rats, no post office, no wireless, no regular church, no residing priest, but it can boast two graveyards and a number of interesting ruins. Such, then, is Inishmurray. The Islander, dressed in a blue jersey and grey trousers, approached, smoking a clay pipe. He looked at me with sad expressionless eyes, but he never spoke. Instead, he ordered two bottles of beer, put them into his pocket, shouldered a sack half full of sugar, and went out. I stood amazed, but the barman told me to follow him, which I did. I kept behind at a respectable distance, and occasionally made noises with my stick on the road, but the Islander never looked behind. We walked like this for about a mile, then we left the road, proceeded along the side of a field, and soon we came to the sea. Here there was nothing to be seen except a boat anchored by a rope to a big stone that lay on the shore. A man moved in the boat when he saw us coming, and jumped ashore. It was then I was noticed. Dan left down the sack, straightened his back, and, looking at me, he laughed and said: 'Sure it's coddin' I thought you were; you're as welcome to the Island as me father or me mother. Step in now, and watch your feet on the lobster pots.' The two men lifted their oars, took off their caps, and crossed themselves in prayer. 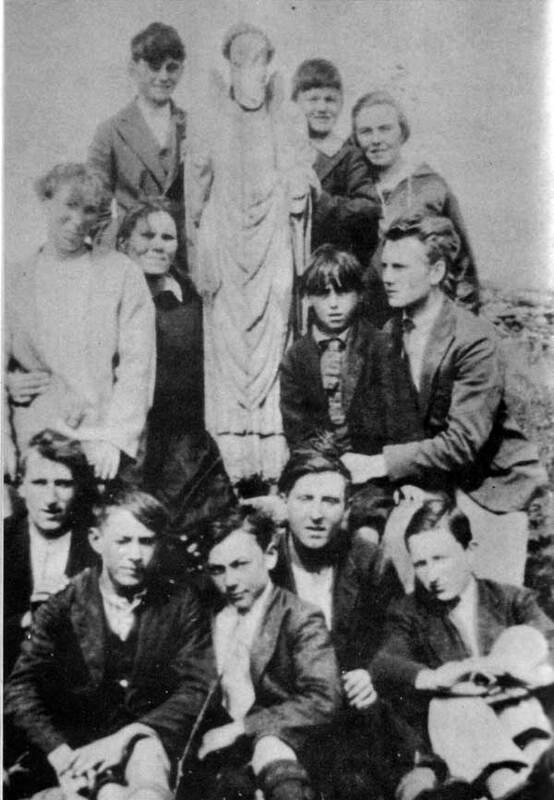 A group of childern from the Island school with the statue of St Molaise in 1926. A head wind was blowing, and I offered to help at the rowing. With the strong outgoing tide, and with three oars, the boat made headway; so fast were we travelling that Dan turned to his companion and said: 'It's well we brought him. Sure it's the spiritual itself weather we have in the boat.' Whether the compliment was passed to induce me to further effort I do not know, but I was glad when Dan ordered Johnnie 'to give her the cloth.' As the boat sailed along in the gathering darkness Dan talked about politics, business done in Sligo, and the condition of the fishing industry. It grew dark and cold and late. The two bottles of beer were produced, pipes were lighted, and the boat sailed on, to many friendly exhortations from the skipper. I looked at my watch, and it was long after midnight. A bright relic of the departing day still glimmered in the west, and in front of this the island showed up like a black, lean rat. The mainland was shrouded in darkness, and only a few fitful gleams of light suggested life. Nearer and nearer we came, but no light shone from the Island. It looked as desolate and forsaken as an old ruin. Johnnie moved in the bow, and standing up he shattered the silence with three fierce whistles. The barking dogs reached our ears, and then a number of lights jumped to life - the Island was awake. 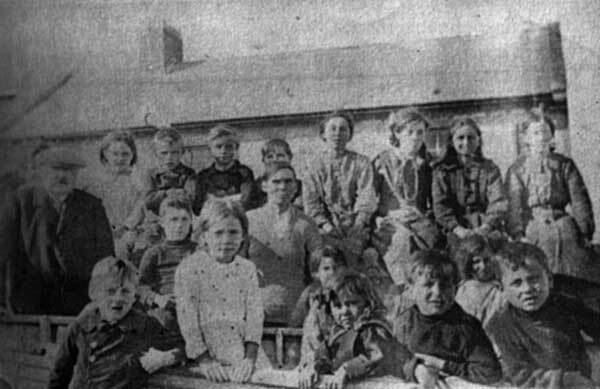 A school inspection on Inishmurray in 1920. The boat moved closer, and a few lights from cigarette ends burned holes in the darkness. The sails were lowered, and the boat was coaxed up onto the slippery rocks of the Island, where her nose was held by a number of men and boys. There was no pier, and the boat was hauled up on the rocks. Dan lifted his bag of sugar on his back, and cautiously I followed him up a boulder-strewn path. We halted inside a house where an oil-lamp embraced up in a soft, warm glow. A pile of turf blazed on the hearth. Two girls prepared a table silently, and a red lamp burned before a picture of the Sacred Heart. I sat on a chair and made myself at home; for it was impossible to feel backward or strange in such an atmosphere of unostentatious kindliness. 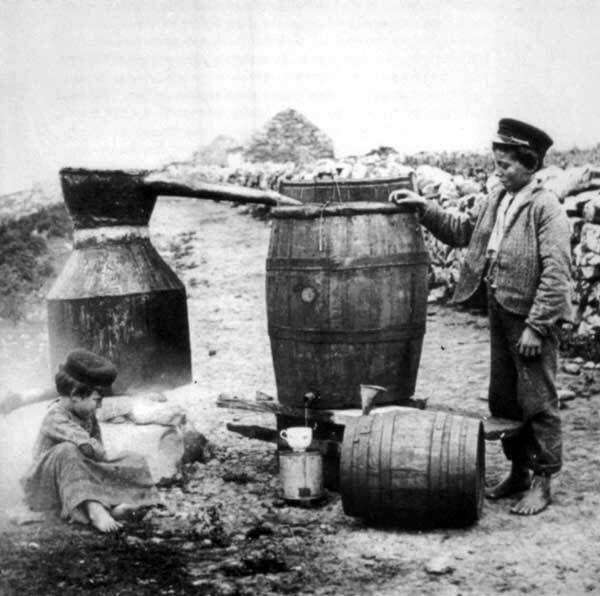 Inishmurray islanders distilled the finest whiskey in the region. Awakening the next morning, I was surprised to see such a small world around me. The Island is not very high, but it is as flat as the proverbial pancake. It is about half-a-mile or less in width, and as for the length, a donkey braying on one end could be seen and heard at the other. How the people live is known only to themselves. There seems to be more houses than arable fields; fully three-fourths of the Island is covered with small grey round stones, grey rocks,, and a small piece of apologetic-looking bogland. 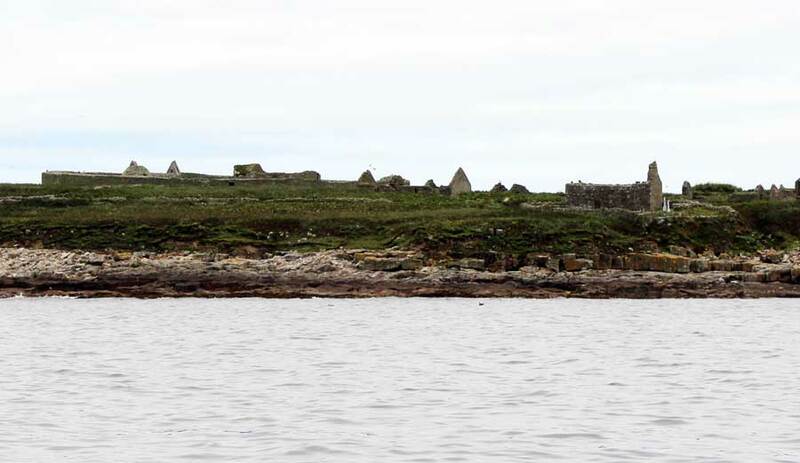 Facing the mainland there is a small strip of cultivated land fronted by white-washed houses. The inhabitants pay no rates, no taxes - how could they? - and yet they have a King, who is treated and obeyed with greater respect than his contemporaries in richer lands. No Communists mar his peace! View of the Cashel and the Women's church from the waters to the south of the Island. Dan brought me up to the royal residence, where I was formally introduced to the King and Queen and the young princes and princesses. The King himself was sitting on a chair and smoking a blackened clay-pipe. He is a small, stockily-built man with a face as red as a lobster, a black moustache, and keen blue eyes as if the sky had flown into them. At first he eyed me critically, while the Queen herself made music with plates and cups as she prepared a royal feast. During the meal, however, his Majesty became volubly opinionative, discoursing politics, politicians, poetry, and archaeology, in a manner that suggested the dignity of his calling. His one regret was the wicked destruction of the fish by the innumerable seals that infest the shores of his kingdom. I couldn't help but feel sorry for him, but as I watched his laughing eyes I wondered if he was as sorry as the tone of his voice suggested. I sat admiring his pleasant demeanour, and after saying grace after meals he said quite naturally: 'Did you see our Saint?' I answered negatively, and in a few minutes I was entering a small iron gate that led to a number of ruins surrounded by a thick, circular wall - a cashel. The statue of St Molaise, right displayed in Molaise's church in an 1880 watercolour by William Wakeman. The statue may have held a bell and croser in his missing hands. Tramping through the long grass and following the King, I halted outside a stone cell about nine feet high and eight feet in width. 'This is the chapel,' said his Majesty, 'and here we go on Sundays and holidays to say our prayers.' 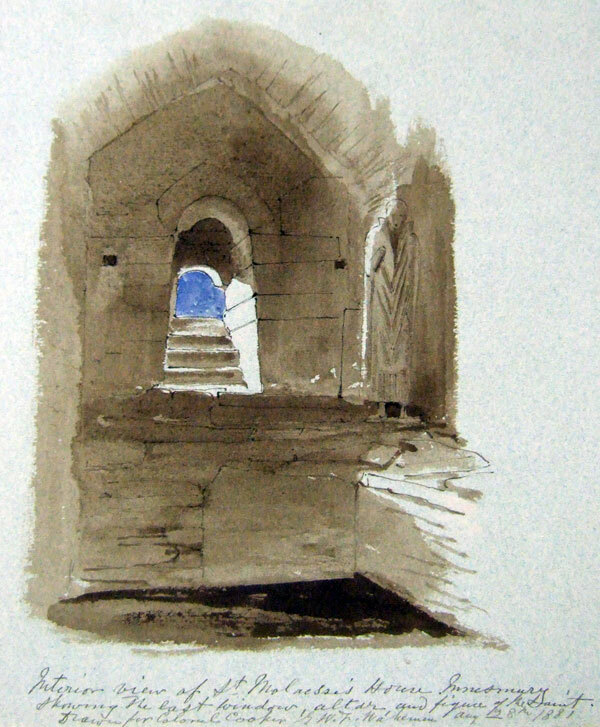 I stooped as I entered the narrow stone doorway. It was dark and damp and cheerless. Light entered through a small slit. In one corner was a wooden effigy of St. Molaise. Patiently and with interest I listened to the legends connected with the now crumbling statue: how the Saint, while at prayer, was murdered by the Danes; and the number of cures performed by the Saint on sick cows. In the cell there remains an old damp altar-stone, with an inscription in Irish characters. The stone floor of the cell was swept clean, and on the altar the Islanders had placed a crucifix and two candle-sticks. The sacred cell is treated with the utmost reverence and respect. 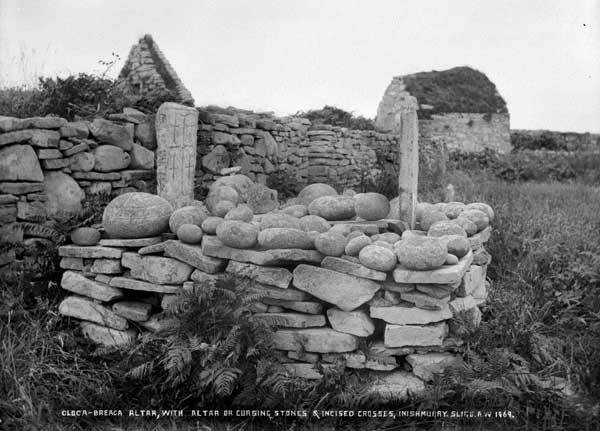 Inishmurray's famous Cursing Stones from around 1900 with a different set of cross slabs than the replicas of today. A replica of one of the largest and most ornate of the Cursing Stones. * The Islanders abandoned their island home in November, 1948. 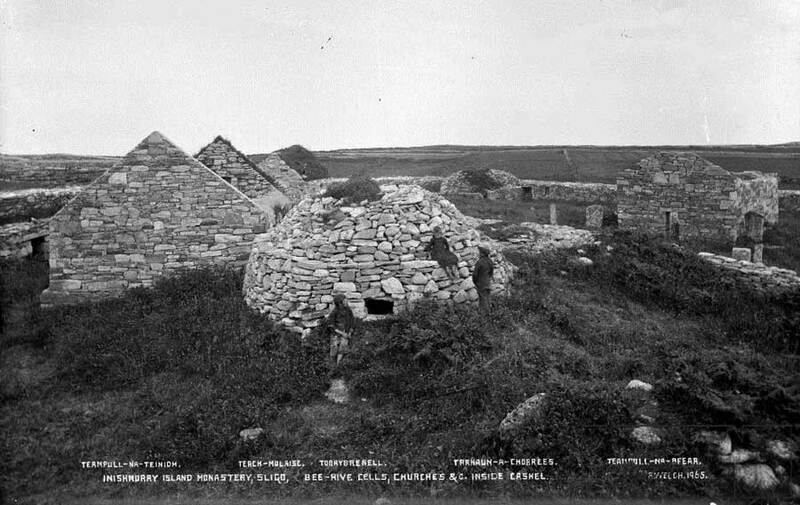 The buildings inside the Cashel, the remains of one of the best preserved early Christian monasteries in Ireland, around 1900.